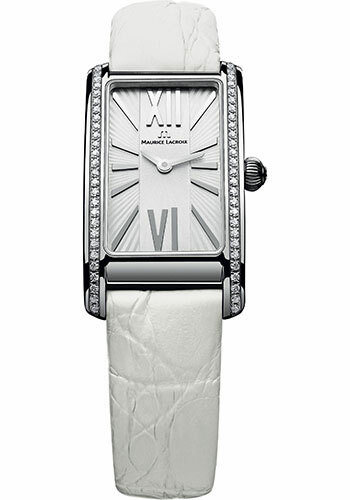 20.9mm x 39mm stainless steel case set with diamonds, silver guilloche dial, quartz movement, white crocodile strap. Water resistant to 50 meters. 39 mm x 20.90 mm polished stainless steel case set with 58 TW VVS-VS diamonds (1.20 mm, 0.3944 ct), domed sapphire crystal with anti-reflective coating, mother of pearl dial with diamond cut hours and minutes hands, 10 TW VVS-VS diamonds (1.20 mm, 0.068ct), quartz movement, white crocodile strap, stainless steel buckle folding. Water resistant to 50 m/5 atm. 20.9mm x 39mm stainless steel case set with diamonds, black dial, quartz movement, black crocodile strap. Water resistant to 50 meters. 39 mm x 20.90 mm polished stainless steel case set with 58 TW VVS-VS diamonds (1.20 mm, 0.3944 ct), domed sapphire crystal with anti-reflective coating, silver dial with diamond cut hours and minutes hands, quartz movement, stainless steel bracelet 3-row bracelet with curved links for optimum comfort, stainless steel buckle folding. Water resistant to 50 m/5 atm. 20.9mm x 39mm stainless steel case set with diamonds, mother of pearl dial with diamond hour markers, quartz movement, stainless steel bracelet. Water resistant to 50 meters. 39 mm x 20.90 mm polished stainless steel case set with 58 TW VVS-VS diamonds (1.20 mm, 0.3944 ct), domed sapphire crystal with anti-reflective coating, black dial with diamond cut hours and minutes hands, quartz movement, stainless steel bracelet 3-row bracelet with curved links for optimum comfort, stainless steel buckle folding. Water resistant to 50 m/5 atm.